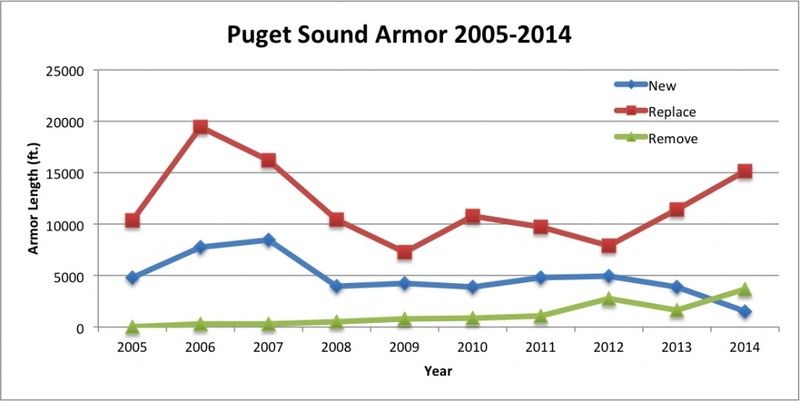 Have we turned the corner on Puget Sound bulkhead construction? It’s hard to describe the surprise I felt when I first glanced at a new graph plotting bulkhead construction and removal along Puget Sound’s shoreline since 2005. On the graph was a blue line that showed how new bulkhead construction had declined dramatically the past two years. But what really caught my eye was a green line showing an increase in bulkhead removal. Amazingly, these two lines had crossed each other in 2014, meaning that the total length of bulkheads removed had exceeded the total length of bulkheads built last year. Not only was this the first time this has ever happened, it was totally unexpected. Few people really believed that bulkhead removal could exceed construction anytime soon. I was happy to write up these new findings in the latest newsletter for the Puget Sound Institute, where I’m now employed part-time. Randy helped develop the “vitals signs indicator” for shoreline armoring, along with a “target” approved by the Puget Sound Partnership. The target called for the total length of armoring removed to exceed the total length constructed for the 10-year period from 2011 through 2020. Like many of the vital signs indicators, this one for shoreline armoring was far from a sure thing. In fact, like most of the indicators, the trend was going in the wrong direction. Some people believed that the Puget Sound Partnership was setting itself up for failure. These were “aspirational” targets, Randy recalled, and meeting them would be a tremendous challenge for many individuals, government agencies and organizations. As I described in some detail in the article for PSI, the number of new bulkheads has declined, in part because of new government rules. Meanwhile, the number of bulkheads removed has increased, in part because of government funding. But something else may be afoot, as pointed out by Sheida Sahandy, executive director of the Puget Sound Partnership, and David Price, habitat program manager for WDFW. A new “culture” may be taking hold in which people realize that bulkheads are neither good for the environment, attractive nor functional when it comes to people enjoying their own beach. 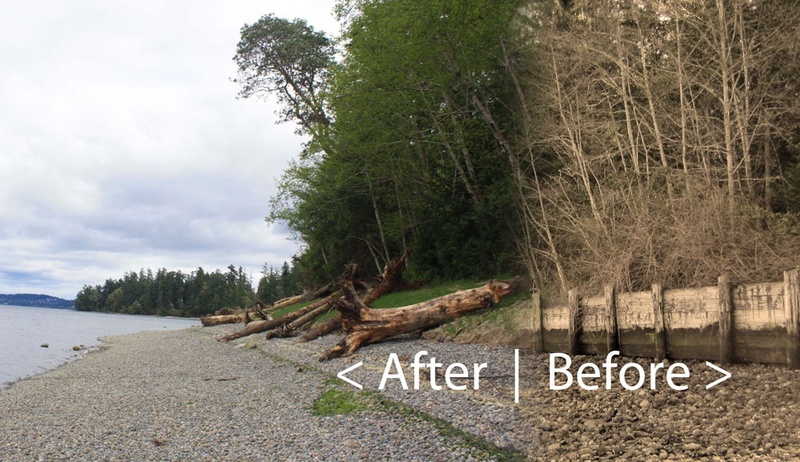 Before and after composite view at the site of a 2013 bulkhead-removal project on the shore of Penrose Point State Park in Pierce County. When talking to shoreline property owners who have removed a rock or concrete bulkhead, often the first thing they tell me is how much nicer their beach has become. No more jumping or climbing off a wall. No more rickety stairs. One can walk down a slope and plop down a lawn chair wherever the tide tells you is the right spot. Getting contractors and real-estate agents to understand and support new methods of beach protection and restoration is one strategy being considered. Personally, I was impressed with the change in direction by Sealevel Bulkhead Builders. Check out the story I wrote for the Kitsap Peninsula Business Journal. It takes a little land to create the right slope to dissipate wave energy without any man-made structure. In some cases, large rocks and logs — so-called “soft shore protection” — can help reduce erosion. In some situations where land is limited and wave energy is high, a solid wall may be the only remedy. No matter which option is used, one must consider the initial cost and long-term maintenance — including consideration of sea-level rise caused by global warming. Loss of beach and backshore, which reduces the area used for recreation, shellfish, bird habitat and forage-fish spawning. Loss of slow, natural erosion, which helps maintain the quantity and quality of sand and gravel along the shoreline. Alteration of wave action, which can impede natural movement of sand and gravel and scour the beach of fine sediment, leaving hardpan and scattered rocks. Increased predation of juvenile salmon by larger fish where high tides leave deep water along the bulkhead, plus fewer insects for food caused by loss of shoreline vegetation. Bulkheads can cause a coarsening of a beach over time, with harder and harder substrate becoming evident. Damage from one bulkhead may be slow and limited, experts say, but alterations to more than 25 percent of the shoreline, as we see today, has taken a serious toll in some parts of Puget Sound. Dave told me about the time he stood next to a concrete bulkhead and watched the tide coming in. Large fish, such as sculpins, were able to swim right up to the wall. The cartoon below was part of this week’s “Amusing Monday” feature, and it illustrates the situation that Dave described. I could say much more about changing trends in bulkheads, given new studies funded by the Environmental Protection Agency, but that can wait for future blog posts. I missed the annual trek to Olympia this year to meet with state and tribal salmon managers, recreational and commercial fishermen and others involved in setting fishing seasons. The event, held in March, is both a reunion and the official start of some serious talks about salmon. Each year, fishermen head to the Skokomish River to catch chinook that have made it all the way through Hood Canal. This year, more restrictions are in store. I’ve always enjoyed the discussions about the number of various salmon stocks expected to return to diverse areas of Puget Sound, the Washington Coast and the Columbia River. Years ago, I observed much more horse-trading — or rather salmon-trading — as experts made decisions about how far inland the fish should be allowed to swim before being caught. Saving enough fish to make it back to the streams to spawn has always been the goal of the negotiating process, known as “North of Falcon” — so named because the discussions are focused on an area north of Cape Falcon in Oregon. I have to say, however, that the discussions began to change after Puget Sound chinook were declared “threatened” under the Endangered Species Act and conservation measures became even more important. Chinook recovery has not been going well, even after major reforms in harvest management, hatchery operations and habitat restoration. So the need to protect the salmon from fishing pressures grows ever greater and the opportunities to catch fish in particular areas continue to decline. 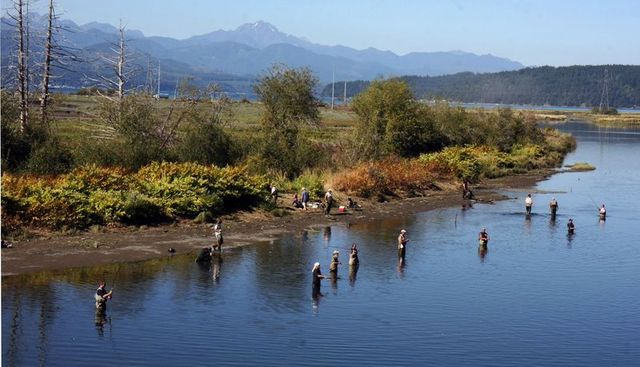 Such was the case this year, when salmon managers decided to forego fishing for chinook in the popular fishing area known as Area 10 between Bremerton and Seattle. Other salmon can still be caught there, but all chinook — even those reared in a hatchery — must be released. I was not around to observe how the negotiations went this year, having retired from the staff of the Kitsap Sun in October. (I’m now doing some in-depth reporting for the Sun and currently covering the Legislature for InvestigateWest.) It appears that recreational and commercial fishers believe that the salmon managers could have carved out some fishing seasons in the area without risking survival of the species. “We fought hard just to keep what we had last year, and then to get the rug pulled out from under us is totally incomprehensible,” said Tony Floor of the Northwest Marine Trade Association, quoted in a story by Seattle Times reporter Mark Yuasa. “With increasing (licensing) fees and the declining fishing opportunities, it makes it really difficult,” said Karl Brackmann, a Puget Sound Anglers board member, quoted in a story by Kitsap Sun reporter Tristan Baurick. Even though sophisticated computer models try to determine how many salmon will be coming back to a given area, it’s still a guess. Deciding how many fish can be safely caught is always a judgment call. I guess this year managers have concerns not only for the wild chinook but also the marked hatchery chinook. 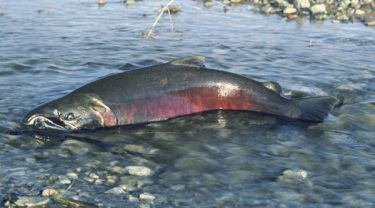 The hatchery chinook, marked by removing the adipose fin, are normally considered free for the taking as long as unmarked wild chinook are released. Lorraine Loomis, chairwoman of the Northwest Indian Fisheries Commission, said fishing reductions were especially painful for tribal and state managers this year, but the cutbacks were necessary. Salmon returns were poor last year, she said, and managers were concerned about ocean conditions and a low snowpack that could lead to increased stream temperatures. “Because of these conditions we may see an increase in pre-spawning mortality of salmon this year, which required the tribal and state co-managers to be extra cautious in setting seasons,” Loomis said in a news release. Anglers will still have good opportunities to catch coho, pink and Skagit River sockeye, according to Ryan Lothrop, Puget Sound recreational fishery manager for the Washington Department of Fish and Wildlife. “Fishing for pink salmon should be excellent in Puget Sound, including in Hood Canal and Dungeness Bay,” Lothrop said in a news release. For details on the fishing seasons, check out the North of Falcon webpage, which will be updated as new information becomes available. Climate change appears to be altering the flow characteristics of Puget Sound salmon streams, and the outcome could be an increased risk of extinction for chinook salmon, according to a new study. I’ve long been interested in how new housing and commercial development brings more impervious surfaces, such as roads, driveways and roofs. The effect is to decrease the amount of water that infiltrates into the ground and to increase surface flows into streams. Stormwater experts talk about how streams become “flashy,” as flows rise quickly when it rains then drop back to low levels, because less groundwater is available to filter into the streams. The new study, reported in the journal “Global Change Biology,” suggests that something similar may be happening with climate change but for somewhat different reasons. “Over the last half century, river flows included in our analysis have become more variable — particularly in winter — and these changes are a stronger predictor of chinook population growth than changes in average winter flows or climate signals in the marine environment. Joseph Anderson of WDFW, an author of the report, told me that chinook salmon, listed as threatened under the Endangered Species Act, may be particularly vulnerable to dramatic changes in streamflows. That’s because spawning chinook tend to show up before winter storms arrive — when the rivers at their lowest levels. The fish are forced to lay their eggs in a portion of the river that will undergo the most forceful flows once the rains begin to fall. High flows can scour eggs out of the gravel and create serious problems for emerging fry, Joe said. Other factors may come into play, but the researchers found a strong correlation between the sudden variation in streamflows and salmon survival. In the lower elevations, where development is focused, flow variability could result from both impervious surfaces on the land and more intense rainstorms. Efforts to infiltrate stormwater into the ground will become even more important as changes in climate bring more intense storms. Stormwater management is an issue I’ve written about for years, including parts of last year’s series called “Taking the Pulse of Puget Sound.” See Kitsap Sun, July 16, 2014. Rain gardens, pervious pavement and infiltration ponds are all part of a growing strategy to increase groundwater while reducing the “flashiness” of streams. Other strategies involve restoring rivers to a more natural condition by rebuilding side channels and flood plains to divert excess water when streams are running high. According to the report’s findings, the variability of winter flows has increased for 16 of the 20 rivers studied, using data from the U.S. Geological Survey. The only rivers showing less variability were the Cedar, Duwamish, Upper Skagit and Nisqually. The effect of this streamflow variability was shown to be a more critical factor for chinook survival and growth than peak, total or average streamflow. Also less of a factor were ocean conditions, such as the Pacific Decadal Oscillation and related ocean temperature. Eric Ward, of Northwest Fisheries Science Center and lead author on the study, said many researchers have focused attention on how higher water temperatures will affect salmon as climate change progresses. High-temperature and drought conditions in California, for example, could damage the organs of salmon, such as their hearts. Salmon swimming up the Columbia River and its tributaries could encounter dangerously warm waters as they move east into areas growing more arid. Some salmon species are more vulnerable to temperature, while streamflow may be more important for others. Coho salmon, for example, spend their first summer in freshwater, which makes extreme low levels a critical factor. Eric told me that further studies are looking into how various conditions can affect each stage of a salmon’s life, conditions that vary by species. One goal is to build complex life-cycle models for threatened species, such as chinook and steelhead, to determine their needs under the more extreme conditions we can expect in the future. 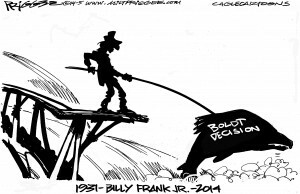 Taking time to remember Billy Frank Jr. The latest issue of “Northwest Indian Fisheries Commission News” (PDF 1.1 mb) is dedicated to the late Billy Frank, who served as chairman of the commission for nearly 40 years. The issue includes numerous tributes from those who worked with Billy through the years. Print copies are available by emailing Tony Meyer or Emmet O’Connell at NWIFC. Jeromy Sullivan, chairman of the Port Gamble S’Klallam Tribe, wrote a tribute to Billy Frank that is worth reading. Jeromy mentions three admirable attributes of Billy Frank and gives examples of each. They are words to live by. Stand up for what you believe in … even when no one else will. Treat people with respect even if you’re on opposite sides. It’s the big and small things that make your community a better place. Read Jeromy’s entire column, written for the Port Gamble S’Klallam Newspaper. 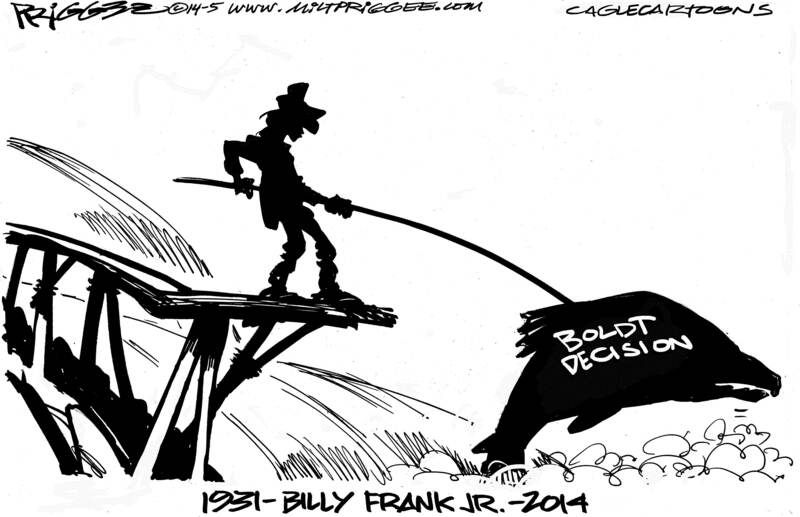 The affection and admiration expressed for Billy Frank Jr. has been somewhat overwhelming in recent days. I thought it would be nice to pull together some of the tributes — including the memorial service — that talk about this man who was an irrepressible voice for salmon recovery, environmental restoration and Native American rights. Billy, 83, a member of the Nisqually Tribe and chairman of the Northwest Indian Fisheries Commission, died last Monday, May 5, at his home. As I said in Water Ways last Tuesday, I believe Billy will remain an unforgetable force. An estimated 6,000 people attended his memorial service Sunday at the Squaxin Island Tribe’s Skookum Creek Event Center, located at Little Creek Casino Resort near Shelton. The service was recorded by Squaxin Streams and posted on the Livestream website, which is the video player on this page. Billy Frank’s own words, “Nobody can replace my life,” speak of the changes from one generation to the next. Billy knew as well as anyone that we can’t go back, but he asked people to help determine a better environmental future. Secretary of State Legacy Project. William D. Ruckelshaus, former chairman of the Puget Sound Partnership’s Leadership Council, of which Billy was a member. Published in Crosscut, May 8. Martha Kongsgaard, current chairwoman of the Puget Sound Partnership’s Leadership Council. Published on the partnership’s website, May 6. U.S. Sen. Patty Murray, VIDEO, speech on Senate floor, May 12. U.S. Sen. Maria Cantwell, VIDEO, speech on Senate floor, May 12. U.S. Rep. Derek Kilmer, D-Gig Harbor, VIDEO, speech on House floor, May 9. Former U.S. Rep. Norm Dicks, D-Bremerton. Statement, Van Ness, Feldman. John Dodge, reporter for The Olympian. Published in the Olympian, May 8. E3 Washington, Education, Environment, Economy. Website, May 7. Leonard Forsman, chairman of the Suquamish Tribal Council, and Jeromy Sullivan, chairman of the Port Gamble S’Klallam Tribal Council, in Kitsap Sun, May 5.